A fresh alternative to baked goodies, these bars are naturally sweet and chewy, a perfect dessert when you’re looking for something light and healthy. Without the frosting, they also make a great take-along energy bar. A vegan, sugar-free version of Rice Krispie squares, made with nut butter instead of marshmallow. Still gooey, still chewy, chock-full of fruits and nuts. The lazy baker’s answer to fig newtons. With a soft crust both beneath and scattered over the top of a rich fig filling, these bars are a great sweet treat that’s high in fiber and nutrition. Not too sweet and perfect for a breakfast on the go. 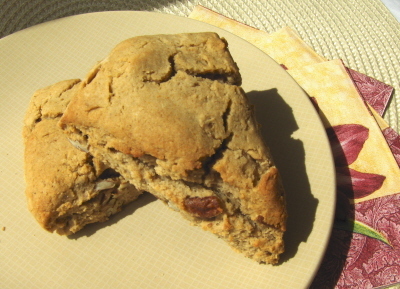 These light, agave-sweetened and fruity scones make a healthy start to your day paired with some nut butter or jam. These are easy to make and bake up beautifully, golden with domed tops. . . . Lighter than regular banana bread and with the addition of chocolate chips sprinkled throughout, these loaves feel like a real treat. Sweetened only with bananas and agave nectar, these soy-free loaves are a perfect little indulgence! 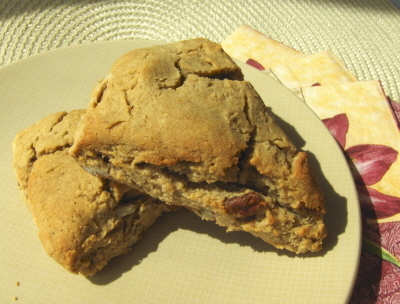 A substantial, not-too-sweet scone brimming with pears and lightly spiced. Great for breakfast or any time of day.